Kia has released images of the new ProCeed ahead of its public debut at the 2018 Paris Motor Show in October. Previously a three-door version of the Ceed hatchback, the ProCeed has grown to become a five-door shooting brake to reflect changing demand from European car buyers. Said car buyers want a big boot, apparently - so that's what the ProCeed's got. At 594 litres, the ProCeed's boot is 50 per cent bigger than the hatchback's, but 31 litres smaller than the Sportswagon estate's. With no boot lip and a lower ride height than the estate, Kia says the ProCeed's boot is remarkably easy to load and unload. The rear seats split 40:20:40 and fold entirely flat, while an underfloor storage area allows smaller items to be stowed away. Developed in Europe, the ProCeed will be powered by a choice of three engines in GT-Line trim. These include the 1.0-litre turbocharged petrol from the regular Ceed and the firm's new 'Kappa' 1.4-litre petrol producing 140PS, while a 1.6-litre CRDi ticks the diesel box. Buyers will also be able to choose between a six-speed manual gearbox and a seven-speed dual-clutch automatic gearbox. Alongside the ProCeed at Paris, Kia will reveal a hot Ceed GT version of its hatchback. This will also be available in ProCeed guise, with a 1.6-litre petrol producing 204PS and 265Nm of torque. 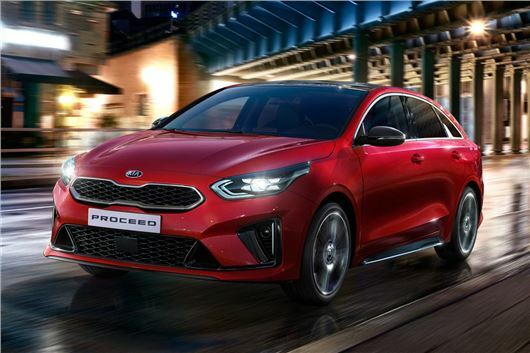 The Kia ProCeed will go on sale in the UK early in 2019. Prices are yet to be confirmed. Just on the provided pics, this looks as if it's the first mass produced "estate" to be considered attractive, since the Audi Avant B7 (2005-08). Any other contenders?. Looks nice, better than its i30 brother, and I'm especially pleased to see the 1.6 t-GDi engine in the lineup as well as the 1.4 - that's the one I was hoping for in the i30 Fastback but it didn't appear. Hopefully the suspenion in the Proceed won't be harsh like it currently is in the i30 Fastback.